What bootlegs have YOU bought? Just curious to see what people buy. Would I ever go out and intentionally buy a bootleg - NO. I ended up with a bootleg Final Fantasy PlayArts figure of Final Form Sora (figure/1447_sor...) a couple of years ago. It was quite expensive but from a Japanese eBay seller. At first glance it seemed ok, the box was very well printed but when I took the figure out and compared it to my other Sora PlayArts figures I had a funny feeling that something was "off." I noticed that the joints seemed loose (he wouldn't hold his poses well), certain spots on the paint job were sloppy (but bear in mind the paint on these figures isn't the best to begin with), airbrush "face-up" details were missing and - TO CONFIRM IT WAS A FAKE - the crown pendant on his necklace was missing! I took the box and held it side by side next to one of my authentic figures and I noticed that the printing on the bootleg was just not as sharp but you had to really be looking. I was really upset and angry, and to this day it still bugs me when I think about it. When I was in Tokyo last fall I found a sketchy little second hand toy store in Akihabara. They had lots of recently released figures for the regular retail price and a lot of "rare" figures for ridiculously low prices - but with a keen eye I realized that about 20% of the stock in the store was fake. All of the recent stuff was genuine, but anything that was over 2 years old you had to really look closely. Standing on the cashier counter were about 10 figures that didn't have boxes but were also for sale. One of them was Final Form Sora. 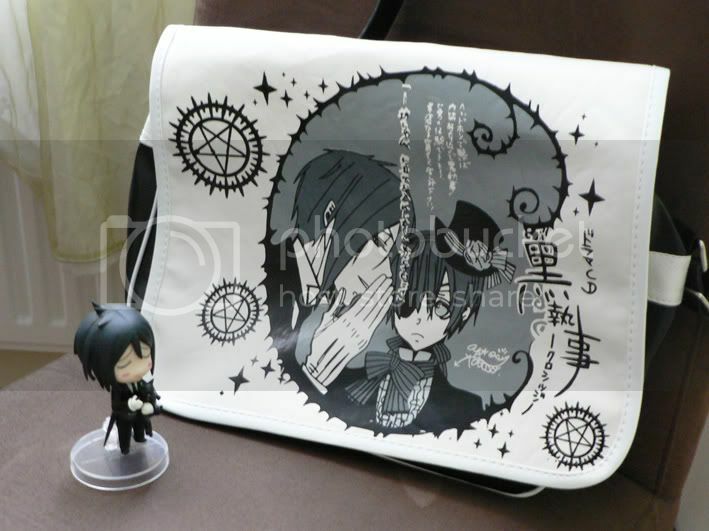 I was a bit shocked to see it there since I had given up on looking for it after the whole eBay bootleg mess... I studied it closely, but the low price made me hesitate. I ran to a "legit" store and studied their PlayArts Sora's very carefully before heading back and buying the figure. I'm 100% certain that it is real, but couldn't be sold for much because it had no box. I didn't think it would affect me as it did, but it took such a weight off my mind to know that I finally had "the one that got away" in my collection. my first would be akemi hasegawa and i didnt know about bootlegs until i bought her and noticed something was wrong with her(all of the other Kotobukiya figures i had were way better than this one), also the box looked badly printed, then i found out there are a lot of bootlegs of her on eBay,i also got stuck with Saber maid GSC and Saber Alter swimsuit fakes, got refund on those but sellers didnt wanted the figure back so they're stuck deep on my closet >_< !! I, like maximimon, bought my bootlegs before I knew about bootlegs and is also an L bootleg. Only it came paired with a Light bootleg. I have a Light and L nendoroids that are bootlegs. It was painfully obvious at the time I received them and unfortunately I was tricked by the low price. The L is okay at best but Light is just terrible. i've bought Asuka Langley summerwear figure on eBay for like $8 USD (Genuine one worth around $55) when I didn't know about bootlegs. i try my best not to buy fakes from eBay, and so far, that Asuka figure is the only bootleg i have. i deal with sellers who are known for selling authentic items on eBay. But HLJ ftw. I also ended up this: figure/694_ayan... Rei as well. Both times the seller showed legit product pictures and not the real pictures of their items. The paint jobs weren't terrible on either, surprisingly enough, though obviously the real ones look a ton better, haha. I think he looks good for a trading figure (has a couple of paint spots but I figured that was standard), but his ankles have a difficult time supporting his weight. Then I saw bootlegs existed, but I still am not quite sure if mine is one or not. I might take detailed pictures to find out the truth. 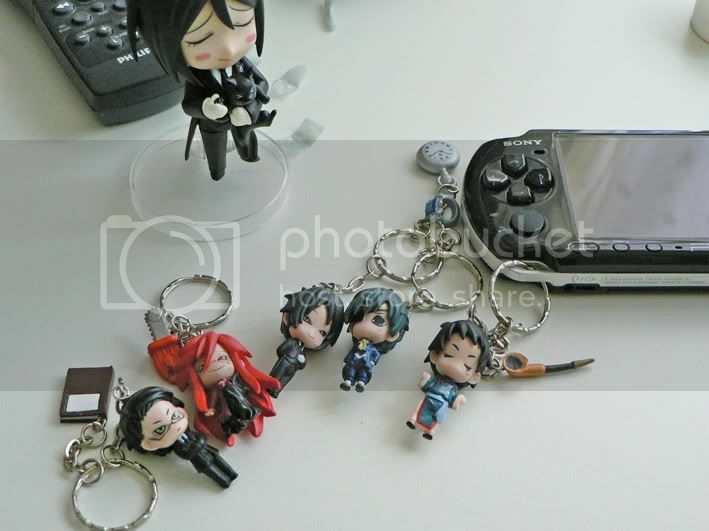 I should probably remove it from my owned list, since it isn't real ^^""
I got bootleg Kuroshitsuji PPP keychains from ebay, haha xD I knew they where bootleg from the start, but I wanted keychains on my kuroshitsuji bag! Before I knew about bootlegs, I got what I now think are bootleg L and Light nendoroids. They both look really nice, actually... I don't have any other nendoroids, so when I get one I will compare them. I'm thinking if I do confirm their bootlegged-niss I'll try and customize them. I remember hearing someone say they changed theirs into a Mello and Near. :D Haha, I should probably get better at painting first. His hair was much blonder than brown, and the skin was yellowish and only recently i realized it was bootleg, but it was cheap like $30 discount and my sis doesn't care for her gift being bootleg. The only bootleg I bought was a FMA's Winry keychain. It was so pretty and well-made. I just wanted it for my keys, so although I knew it was a bootleg, I bought it pretty cheap ($4 -argentine pesos... it would be like U$S1,25). Half a year later I lost the effing keychain. I got a play arts squall for christmas, i think he is a bootleg for several reasons, his chin skin color is alot more pink than the rest of him, which makes the paint on his face look a little strange, there is some paint slop on the belt, and his necklace broke right out of the box plus it was off center even in the box. Other than that though, he looks just like the official pictures, if it werent for the strange face skin color he would look rather awesome. I also think my demon inuyasha is a bootleg, ive owned him for a while but just realized that he has an extra sword on his side that the official pictures dont show.....i would post pics of them but i dont know how to link pics to a post. Those would be my first bootlegs. Hmm.. I think the first ever I bought were a couple of FMA keychains years back. I wasn't aware of bootlegs for figures at the time. Two years later, I bought a bootleg Misa nendoroid from a con(still wasn't aware...). I noticed something was off about her, but I couldn't put my finger on it. And she was missing her cross necklace too. This one pisses me off the most because I paid the original price for her. >:I Geh. After those, I now check for official stickers on everything and do extensive research on a figure to see if it's been bootlegged before I get it off a site like ebay. I do too. I check the stickers and look at the figure closely. Before I wasn't able to, but now I can tell a bootleg from a legit one. When I was younger I did buy some bootlegs (those little keychains and Lucky Star Petits), but somehow I also managed to find legit figures as well. O_o I wasn't sure about what they are until I ended up working for an anime store that sold bootlegs and stuff lol, but luckily all their real figures (like nendos in boxes and figmas) were real. It's only those keychains and stuff that are ripoffs, but still it's bad to sell the stuff.